Valentine's Day is around the corner, and you still have time to surprise your sailing sweetheart. Valentine's Day can seem stressful when you're pressed to find the perfect gift, so we've found some options that might just help save the day. 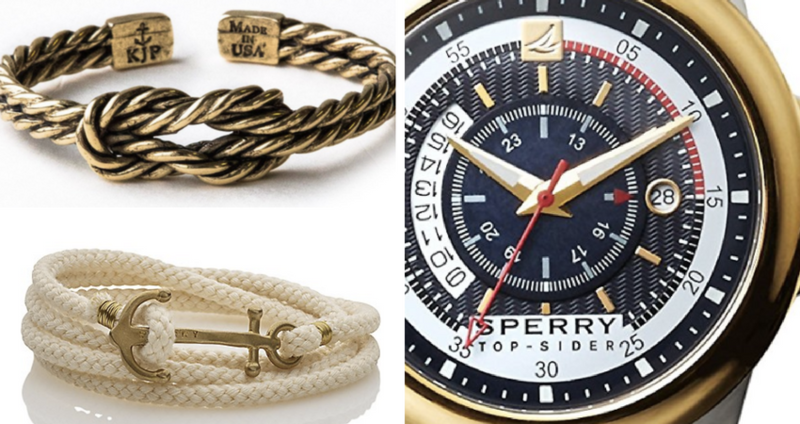 Check out our nautical recommendations for the salty, sparkly, or even-keel boater in your life. Keep in mind: with any boating-related item you gift someone, big or small, it's the thought that counts. It's also the perfect way to present them with something that can't be gift-wrapped: an adventure! Pair a present with a weekend away and you're more than golden. If you live within driving distance, you can find some sparkle at SailorMade in Boston and Lemon & Line in stores along the east coast. For those shopping for gents, we love the Sperry Top-Side Skipper watch. For most of our blog posts, we ask our boaters and friends for input. One friend of Dockwa had this to say: "For Christmas, I bought him everything from Yeti. It doesn't matter if you're a boater, all men love Yeti." Check out one of our favorites, YETI's stainless steel insulated Rambler. Want to tell your first mate they light up your life? Try on a pair of Ray-Ban Wayfarers for him or for her. Show your boating valentine how much you love not fighting with them. The amazing Hook & Moor Boat Hook makes every mooring-catch a breeze. What better way to invite someone to be your first mate than to make sure they're comfortable lending a hand? Gift your Valentine the Partner in Command BoatUS online course. When you need a study break and are buried under snow like we are in New England, cozy up for a funny Valentine's with a showing of The Love Boat. Remember: One gift that never goes out of style is a romantic weekend cruise. From Maine's rocky coast to the sunny Caribbean, Dockwa makes planning your next trip a breeze. Book a slip for two at one of your favorite destinations, or keep things lively and explore new waters!